Today's Alternet article on BDS Flash Mobs features US Campaign member groups St. Louis Palestine Solidarity Committee, Adalah-NY, and CodePink, illustrating "how enthusiasm and new media can drum up power." 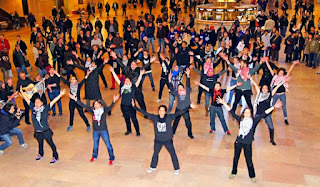 BDS Flash mob in New York's Grand Central Station. Photo: Bud Korotzer. Not long before Christmas, in a Best Buy in a St. Louis mall, 86-year-old Holocaust survivor Hedy Epstein performed a synchronized song-and-dance number to the tune of “Telephone,” rocking black pants and a turtleneck in lieu of Lady Gaga's metal-studded bra and crotch cover. Epstein, along with a cohort of mostly young women, urged the bewildered holiday shoppers to “hang up on Motorola,” a company that sells Israel surveillance equipment used in the Occupation. "Aiding in apartheid and being sneaky/tell us what you're doing with your technology," they sang. On YouTube, the Lady Gaga parody became something of an instant classic in a small but burgeoning activist video genre. “I had always wanted to be a part of a flash mob,” explained coordinator and co-lyricist/choreographer Banan Ead, a 32-year-old Palestinian-American, remembering the fad’s heyday a good half-decade ago. Flash mobs were the pre-YouTube brainchild of former Harper’s editor Bill Wasik. In June 2003, an email invite brought 200 people to a Manhattan Macy’s, where they converged around a giant carpet, telling clerks they lived together in a commune and were shopping for a “love rug.” Soon, flash mobs were like Starbucks: everywhere. Wasik had set out to make a grand joke of hipster conformity, calling his creation “an empty meditation on emptiness.” While the original flash mob was essentially an apolitical situation comedy, today it is enjoying a revival as a movement builder. The cause is Boycott Divestment Sanctions (BDS), a non-violent, Palestinian-led movement inspired by the campaign against Apartheid South Africa. Launched in 2005 by a call from Palestinian civil society groups, in the wake of the 2008-2009 assault on Gaza, BDS is gaining traction both globally and within Israel.